Aduro A/ S is a very successful Danish stove manufacturer. All Aduro stoves are Swan labelled and equipped with a device that automatically regulates the primary air supply, which – all other things being equal – will ensure optimum combustion. The human factor, however, plays a very important role, and maximum energy efficiency and minimum pollution also imply that the supply of wood takes place in an optimal way. Aduro turned to Develco to develop an intelligent device that can guide the user to the perfect use of the stove. Aduro turned to Develco to develop an intelligent device that can guide the user to the perfect use of the stove. The biggest development challenge was that the electronic device should function reliably under very high temperatures. It was also desirable to have a very long battery life in order to minimize the user’s effort in making use of the application. The project was also a challenge in terms of cooperation, as Aduro had no experience with electronics. So the process was instructive for both sides and improved Develco’s communication skills. The intelligent device is named Aduro Smart Response (ASR), and it can be installed afterwards to existing Aduro stoves. Develco developed ASR as an electronic device with an activation button and a temperature sensor which communicate wirelessly via Bluetooth Low Energy with an app on an iPhone or iPad. The choice of Bluetooth Low Energy meets the requirement for battery life. In order to ensure the functionality in the high temperature range, it was decided to use a thermocoupler with a dedicated integrated circuit. ASR monitors combustion by collecting and logging data on temperature trends. 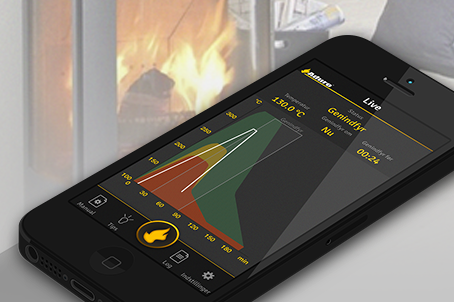 The app converts the measured data to relevant information and on this basis guides the user as to proper wood burning. With ASR Aduro A/S has achieved a complementary device to its product portfolio which is valuable for both current and future owners of an Aduro stove. ASR has technologically lifted Aduro into the “Internet of Things” league. Like many other intelligent solutions, ASR helps the human user to become more knowledgeable and also to act intelligently. The value of the optimal wood combustion has an economic aspect, but the significance on the environmental report should certainly also be highlighted. The potential reduction in harmful particle pollution from stoves in general is enormous. Aduro has therefore with ASR initiated a technological breakthrough of great social value, and of course this is also a very positive selling point in a world of growing environmental awareness among consumers.